Alexander Hamilton grew up on the island of Nevis in the British West Indies. The island was famous for its sugar plantations. He didn’t attend the Anglican schools on the island but he got some home schooling. He learned French from his mother and read all the books he could get his hands on. Hamilton’s mother bought books for him and his brother James. It’s unclear what kind of education Rachel Hamilton had, but she made sure her sons read Machiavelli and Plutarch, along with some poetry and sermons. The boys became orphans when their mother died after an illness; their father James Hamilton left the family when the boys were younger. Young Alexander was taken in by a merchant named Thomas Stevens. Hamilton became best friends with Stevens’ son Edward. He also got a chance to use his natural curiosity by doing interesting work. The firm Beekman and Cruger supplied whatever the sugar planters needed. Hamilton always viewed his apprenticeship there as the most useful part of his education. He learned to track freight, chart courses for ships, and calculate prices in different currencies throughout Europe. Despite his interest in business, Hamilton wanted to move up in society. He hoped to go to college like his friend Edward Stevens who was studying in New York. In a letter to his friend, Hamilton wrote, “my ambition is so prevalent that I…would willingly risk my life, tho’ not my character, to exalt my station.” Fortunately for Hamilton, some of his poems and a letter he wrote describing a storm on the island were published in The Royal Danish American Gazette when he was seventeen. The local businessmen were so impressed with his writing that they raised money for him to sail to America and attend college. Though Hamilton was naturally intelligent, his lack of formal schooling meant that he needed to take some extra classes before applying to college. He studied Latin, Greek, and advanced math at Elizabethtown Academy (near Princeton). After completing those classes, he applied to Princeton. The school, however, wouldn’t let him take as many courses as he wanted. Hamilton attended King’s College in New York in 1773. King’s College was more conservative than Princeton and many staff members were Tories who supported the British monarchy. Hamilton was in a hurry to catch up to other students who started college at a younger age than he did. Some speculate that he altered his birth year from 1755 to 1757 so he would seem closer in age to his fellow students. He spent his free time auditing classes and reading books in the university library. While in college, Hamilton and his friend Robert Troup formed a club. The club focused on writing and debating—skills that Hamilton later drew on during his political career. The club also helped Hamilton refine his political views. He wrote anti-British pamphlets that clashed with the views of his college professors. Fortunately, his first political tract—a defense of the Boston Tea Party–was anonymous. Though respected as a great general in the Revolutionary War, Washington was very self-conscious about his lack of education. 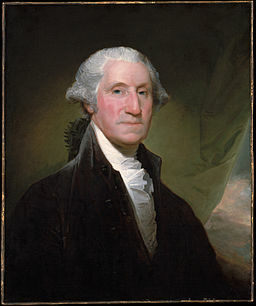 Unlike the other colonists with whom he served in the Continental Congress, Washington never attended college. In fact, Washington had only an elementary school education. He did, however, attend dancing school at age fifteen. His dancing skills certainly came in handy when he became the first President of the United States and had many parties to attend. As president, Washington invented the presidential cabinet, filling it with men he felt had the best qualifications rather than picking personal friends or allies. He called his cabinet members, which included Thomas Jefferson and Alexander Hamilton, his “first characters.” Though he was the only president who never lived in the White House, Washington chose the site and the architect for the house. Before he died, Washington toured the nearly completed mansion.